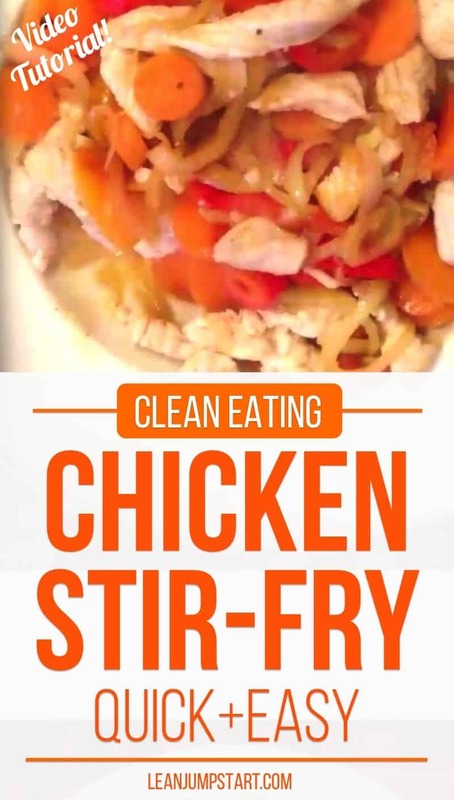 I love the ease of this clean eating chicken stir-fry recipe. This chicken vegetable dish is a highly flexible one-pot meal that can use up all veggies in your pantry before they go bad. I used this recipe for the first time many years ago when doing the cabbage soup diet. I needed a chicken recipe for day 5 or 6 that was easy to make, lean and suitable for the detox week. And although this is very long ago and I don’t need this rigid diet any more I’m still sticking to this healthy recipe. If you can afford it – make sure to use organic chicken for this clean eating chicken stir-fry! Find the recipe below and I’ve also added a short video for your convenience. Cut chicken chest in stripes. Mix lemon juice with garlic, turn your meat in it and let it steep for 5 minutes. Wash your yellow pepper and cut it in small stripes. Heat oil in a large coated pan or wok. Stir fry your chicken meat 3-4 minutes while turning it around. Take your meat out and put it warm. Stir fry now your vegetables for 4-5 minutes. Pour in the broth, add chicken again and heat it up. If this dish is too “lean” for you or your family you can add brown rice or quinoa as a side-dish. As promised here comes my short video showing you in 1 minute how I make this clean eating chicken stir fry recipe. Enjoy! Let me know what you think about it in the comments below and don’t forget to subscribe to my Youtube channel for more videos to come! If you are a regular reader of my blog you might have realized that you won’t find many meat or animal based recipes. Maybe you think I turned vegan like my daughter did some years ago. But this is not true. I will still eat meat, fish or dairy on very rare occasions, but I neither need it nor do I miss it. And above all I never enjoyed cooking with meat. So you might ask were do I get my protein from? Over the years my main protein sources were a combination between fish, dairy and legumes. But the more I dig into unbiased scientific research, (I took part at the food revolution summit 2018 recently) the more I come to the conclusion that the healthiest nutrition form is a mainly clean and plant based. So may main protein source comes from the fiber rich legumes, nuts and seeds, although I will never see my nutrition as dogmatic as e.g some vegans do. By the way, did you know that there is no fiber at all in animal based foods? Click here to check my popular list of high fiber foods. On top of that – and this is evident – a nutrition leaning mainly towards plant based foods respects not only the animal rights but also protects our precious ecosystem and in the end our planet.